Need a break from all the craziness as we near the end of the semester? Us too! 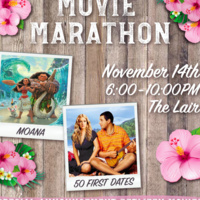 So come together in The Lair for a double-feature movie marathon; showcasing "Moana" from 6-8 PM and "50 First Dates" from 8-10 PM. Popcorn will be provided. In between movies, we will also have a very special announcement! Be one of the first to find out what it is; you really do not want to miss this!